I can't say thank you enough - not just for the game, which is EPIC, but for the wiki, the forums, the players, the mods, but especially for the developers! Thank you, thank you, thank you! I noticed that bluprint Shift-place now automatically removes trees and rocks AND then places what you originally wanted in the spot. I would swear that shift-place did not use to remove the obstacles. Such a simple change and yet a major quality of life improvement. Thank you! I'm not sure wether the devs deserve to be praised or hated for what they did here... games like factorio are the pinnacle of greatness while also being the worst thing that could possibly happen to someone. It has completely consumed my every tought for so many days... I started a long time ago with a pirated version, I got hooked... wel... not really hooked... played about 800 hours in a few weeks... then i bought the game and then i played another 200+ hours and then converted all my friends to my new found factorio religion (i call it the "bigger is better religion"). You can blame me all you want for pirating the game but these devs made a game that convinced me to pull out my money and pay for literally nothing extra from what i had out of sheer respect. I hope one day more companies follow your model. Make great games again. Factorio 2018: no microtransactions, no lootboxes, early access with more content that AAA games, second best rated game on steam, the game that convinces pirates to buy it not by DRM's or sophisticated encryption but by just being the best there is. And you devs, you may not be swimming in money like the assholes at EA do but you will always have something those assholes will never have: the hearts of every one of your players. GG! long time lurker and player here, have had the game since before steam, and still learn new things almost daily while playing or watching other people's videos on YouTube. I would like to say Thank You to the devs for making such a terrific game, and I just got done reading what's MIGHT be in store in future releases (space, underground, etc) and am really looking forward to if there's an RTS element added. I normally play with peaceful mode enabled as I like to just build and expand, but if RTS elements are added I may just go and attack and get the ball rolling with the enemies lol. Anyway, thanks so much again for a great game, and hello to everyone. New to the forum but already 333 hours in the game. I was in love with OPEN TDD and could not find a game which would use exactly same "feeling" by playing. Never had one again until i discovered factorio. Simply amazing game, amazing job for devs. Anyway, amazing job, this game is worth every penny. This game is great. Thank you for the best game I’ve ever played. I always wanted a giant model train display and now I have one bigger than I ever could have imagined. Please make the biters more relevant to the game. hello dear developers, I am writing here to express my feelings of gratitude. When I think of the countless hours, the dedication, the passion and the devotion that went into this project I feel only more so grateful. What especially spoke to me personally is the random map generator that lets you create entire worlds and watch them come into existance from the satelite view. I don't know how many hours I spent making and adjusting maps. The music is also really well done I feel, you can let it run quietly in the background and it never gets old or annoying. The graphics is also something that spoke to me. The simple elegance of the plants, the trees, the ground, the water ... I think this elegance in simplicity lends an unrivalled charm to the game. And I hope that these "low resolution graphics" will remain an option for less powerful computers (like mine, I am on a laptop ) and people who simply enjoy the simplicity over performance hungry HD graphics. With any project there come points where one wants to throw in the towel, because things just don't seem to work out or people get really mean and unemapthic and make you wonder if all humans ever do is demand and criticise and take things for granted. I have looked over the "Factorio developing explained in gifs" thread and it is really adorable and very intuitive in explaining how you developers felt and still feel. So I want to say thank you for not only creating this wonderful creation of a game but also for not giving up after all this time and still not giving up even today. I feel that Factorio does all these things right, there is quality, character, choice, freedom and a seemingly limitless potential that invites you to play the game with your own creativity as a factory to produce entertainment for both others as well as yourself. Thank you very much and I hope that developing factorio remains rewarding for you developers for a long time to come yet. Thank you for creating most addictive game sice Heroes of Might & Magic III. I'm sure I said this before but... I love the game so much that I would actually physically please all of the devs. Not even making that up. Honestly I don't see why more people play this game. It's a simulation of being a productive person and I can see why almost any type of person, once they give it a chance, would really get into it. I also believe that this game activates a variety of cognitive and logistical practices that do improve critical thinking and problem solving skills, all while being disguised behind an entertaining game. Also a very rare element behind Factorio are the developers themselves. I'm actually truly astonished to see a development team/company actually be so active and care about not only the work and art they produce but also the feedback of the fan base and how they literally shape their game around it. Most Dev teams wouldn't give a damn until it had half of their fan base whining about the same problem enough to annoy them. Lastly, the FFF is a great way to not only stay posted about the updates blah blah but also learn about the game as it changes and getting a first hand post from the creator(s) themselves is remarkable. Truly factorio you're amazing, thank you to all of those who work hard on it. Yes, Factorio certainly does set new standards, both in terms of software quality and gameplay. Despite still being in early access, it is already far superior to most AAA titles that have been released. It seems this is a good time to send a little more love to the development team: thank you so much for what you do! 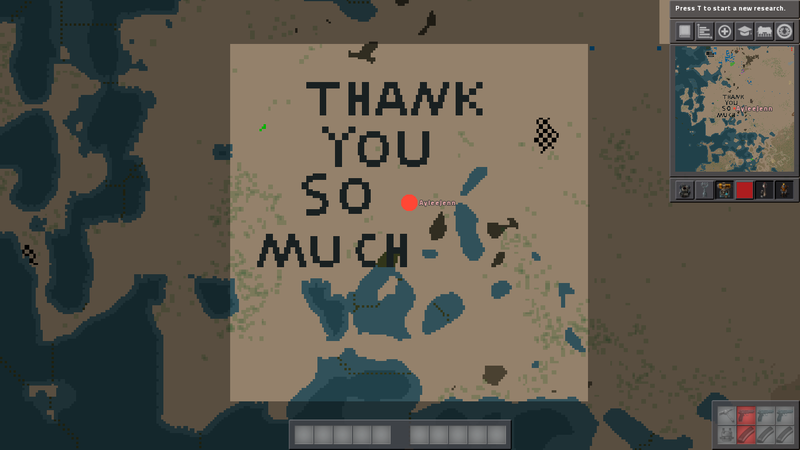 Thank you for all the (thousands of) hours of fun exploring, researching and building! Thank you for caring so much about players like me that you spend your days building toys for me to play with! You guys are awesome! You are the best! You ROCK! I went ahead and registered an account to chime in, here. I started playing fairly recently and only have a few dozen hours in so far, but I think about this game a lot when I'm not playing it. Going over logistical problems in my head, thinking about future base plans, coming up with strategies for expanding into or past biter-controlled areas, thinking about what I want to research or how I want to use what I have unlocked so far. I find the game just utterly fascinating. I love watching my base in motion, bots flying back and forth, belts carrying so many little items around, inserter arms whipping back and forth, trains zipping around. It's like a ballet that I choreographed myself, and it's so satisfying to set everything up and watch it go! So yeah, thank you for making Factorio! I'm really looking forward to 0.17 as well, keep up the great work! I have been playing Factorio for a long time now, maybe not as long as some people. I've gotten 5 friends into the game world. Everyone of them looked at the game from the outside and shrugged but once I bought them the game they put in 60+ hours on the low side. All that to say, your game is so good, I've bought 6 copies and I never once regretted my purchase. All that to say, your game is so good, I've bought 6 copies and I never once regretted my purchase. I actually felt guilty for only having paid such a low price for such a great game. Therefore, I hope that they will someday release some DLC, so that I can give them more money. Until then, I will continue to recommend this game to all of my friends, so that they buy the game too. I've bought it only once and that it's so cheap for a limitless game is true. I really love it and now I'm exploring the modding finding huge changes to the game, then for the price of one game I've bought hundreds of different games. Bob, Angel, Bob/Angel, IA, dark matter, etc. etc. etc. This is not a single game, but a whole universe of games. Oh, a big thanks even to each single modder. And to developers for have bought a game with all this potential.